Peter (second left) presenting the prize to the head of the winning team, Haeruddin Nurdin. 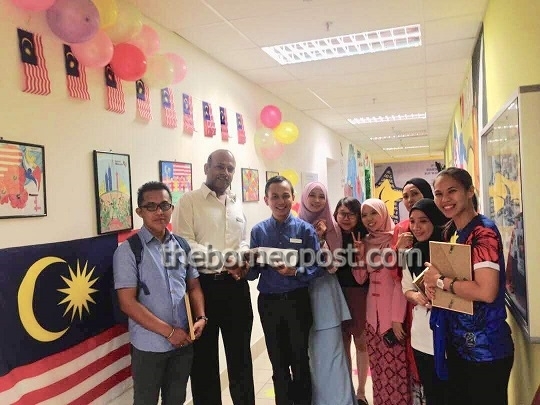 SANDAKAN: Associates of The Four Points by Sheraton Sandakan initiated a drawing competition to commemorate the 61st Malaysian Independence Day. The theme, which is based on this year’s theme ‘Sayangi Malaysia Ku’ received an overwhelming response and the three external judges, Roslee Jaafar (professional art and culture), Emilina Gustin (head of dental unit) and Eva Mohamad (Zumba instructor and teacher), were captivated by the final products of the talented staff. Roslee complimented the hotel’s general manager, Peter Padman, for having such a motivated and joyful team of employees while commenting that he was in awe of the 10 final artworks which expressed so much detail and love by the associates for their much adored country, Malaysia. When asked why this drawing competition was organised, Peter said that his team had been working so hard over the past few months with so many new implementations within the company, and with the ongoing integration of Marriott International with Starwood, he felt that his fellow colleagues could do with a break from the daily routine which had somewhat been quite stressful lately. He added that the associates, who were a team of Malaysians, expressed so much passion and love for their country through the drawings and it was brought to reality that a picture does paint a thousand words. The competition, which was open to all 10 departments of the hotel, was won by the Human Resources Department, led by Haeruddin Nurdin, the Human Resources Manager. Their painting represented the various cultural and ethnic groups of the country who live in perfect harmony from the North to the South, from Perlis to Sabah. The various colours were explained in detail as to what it represented, while not forgetting the meaning of the Hibiscus as the National flower and the iconic KLCC tower that showed the progress and development of the country over the 61 years.